General hospital AZ Alma has commissioned a new regional hospital, to optimise its functions and services. Presently, the hospital still provides its services at two other locations. These locations will be given a new purpose once the hospital services have moved to the new location, foreseen for 2017. 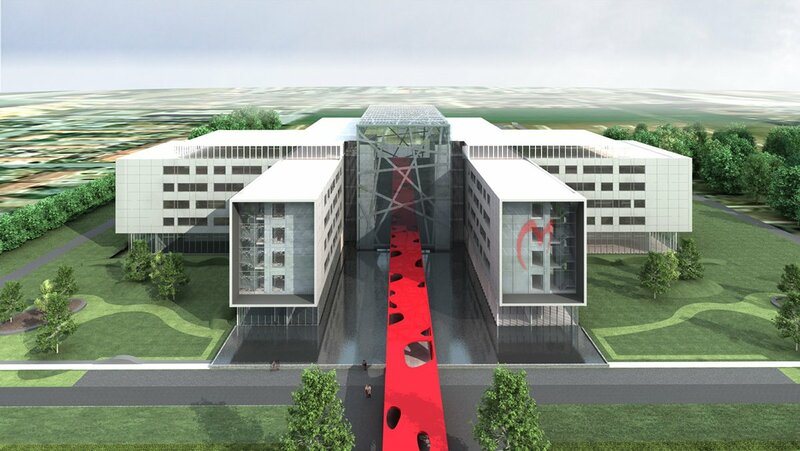 The new hospital will count 512 beds, to be housed in two T-shaped wings, consisting of seven floors each, with a total area of 55,000 m². They will be connected by a central glazed atrium with ‘panoramic’ lifts. The hospital will employ 110 doctors and 1,200 co-workers. Besides the general services of a regional hospital, it will also boast a spacious polyclinic, a day clinic, a rehabilitation department and a dialysis department. Next to the hospital there will be two new car parks for staff and visitors, offering more than 1,000 places. The central atrium will contain a whole range of communal functions, including a reception area, registration, a newspaper and magazines outlet, a restaurant, sitting areas and greenery. The central glazed atrium between the hospital wings consists of a steel structure. Due to the large dimensions of the hospital, dilatation joints are foreseen between the atrium and the hospital wings. All beams and columns of the atrium have different angles which were sketched by the architects. This results in a random load bearing structure in both the façades and roof. The atrium measures 66 m by 28 m and is 28 m high. At the front side of the atrium, there are eight elevator shafts and two staircases, linked by post-tensioned concrete beams on each level. At the rear side of the atrium, four footbridges with a length of 28 m form the link between the two hospital wings. The roof consists of primary beams HEB650 – spanning 21 m – and secondary beams. 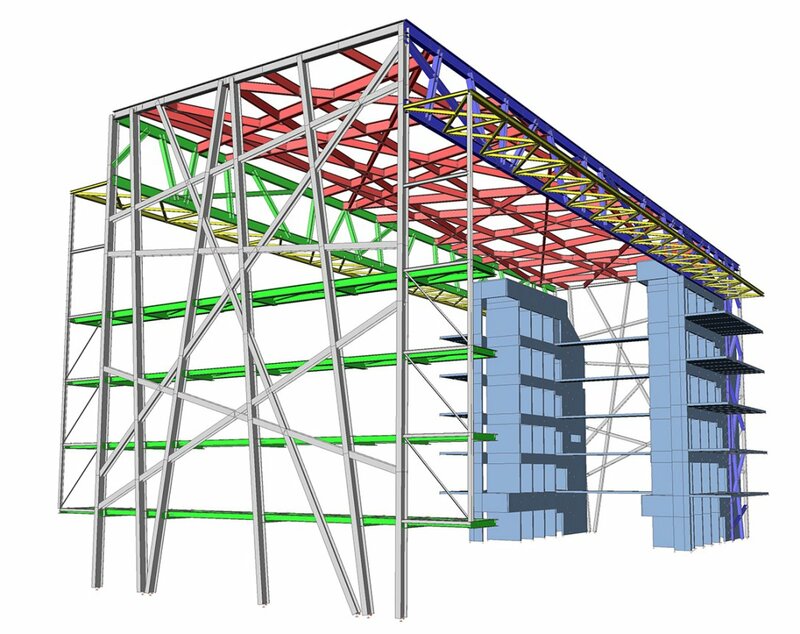 The primary beams are supported by two large trusses with a span of 42 m. As a matter of fact, the truss is a mixture of a triangular and a Vierendeel truss. It is supported by the rear façade and one of the elevator shafts. The horizontal stability is assured by both the concrete shafts and the steel façades. The façades are therefore considered as a bracing mixture of a triangular and a Vierendeel. They consist of steel beams HEA300 and HEA500. The front façade (21 m by 28 m) is horizontally (perpendicular on the façade) at six points supported by the elevator shafts. The footbridges at the rear side of the atrium hang as a balcony on the rear façade, which results in moments and horizontal forces perpendicular on the façade. The rear façade is horizontally (perpendicular on the façade) supported by the footbridges which act as horizontal wind bracing trusses. 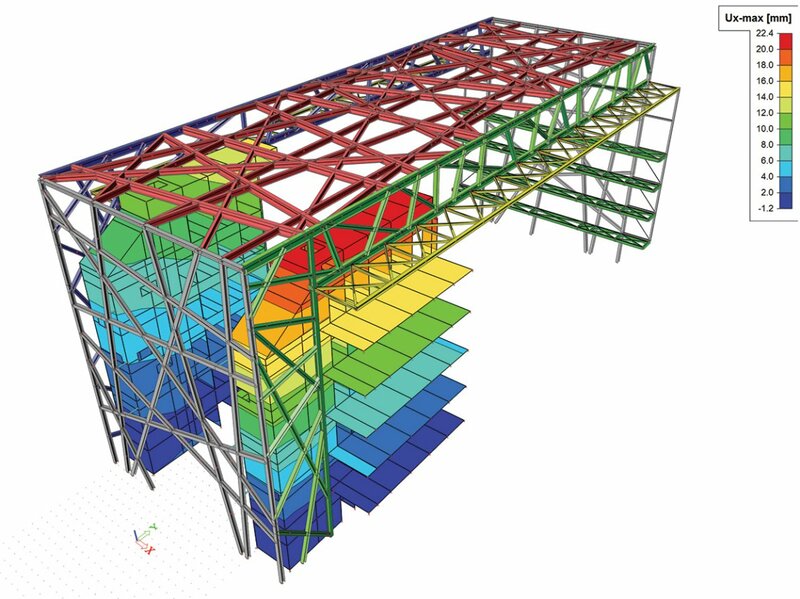 For the structural analysis of the glazed atrium, Scia Engineer was used. Both the steel structure and the concrete shafts were modelled. The main challenge was to limit the deformations of the roof, the main trusses and the different façades according to the allowable deflections for the glass panels. There is a mobile bridge between the main trusses – for maintenance of the glazed roof – which results in additional severe limitations for the deflection of the main trusses. 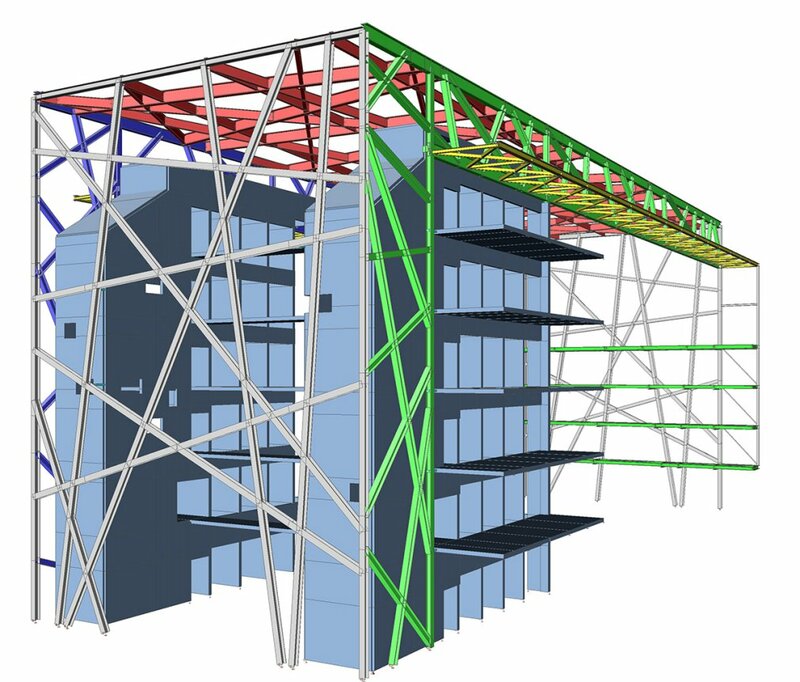 Scia Engineer was used for the optimisation of the steel structure, in the function of allowable deflections and strength. Concrete shafts were modelled to evaluate the collaboration of the vertical steel bracing in the façades and the concrete shafts. The Scia Engineer model is also being used by the contractor to calculate all the steel connections and in making his montage study. Therefore different mounting stages and additional load cases will be added to the model by the contractor in the function of the mounting sequence. Due to the montage of the steel structure, the reactions on the foundations need to be re-evaluated. Thanks to the fact that Scia Engineer has been widely used, it is possible to use one global calculation model from both the contractor and the main design engineer.